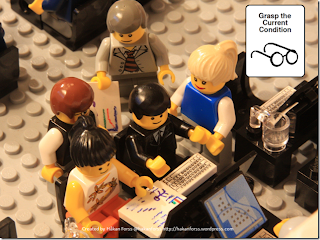 Here's a great slideshow dealing with Toyota Kata. Although the presentation is in Swedish, only a few of the slides have Swedish language text, so it's pretty easy to follow along. If you're having difficulty, I ran the slide notes through Google Translate and added it to the end of this post. It doesn't really add much, though. I prefer just looking at the cool pictures. Toyota Kata is a book written by Mike Rother. I have to say from the start that this is an awesome book and I highly recommend it. The book talks about kata, which roughly translates from Japanese as a "way of doing." The improvement kata, as described by Mike Rother on his website, is the method of teaching and coaching improvement activities. The Toyota Kata? Toyota's way of coaching and reinforcing improvement throughout their organization. An excellent book for anyone looking at changing their workplace culture. The slideshow talks about the improvement kata, with pictures. How should the team work together? What is the proper way of coaching? 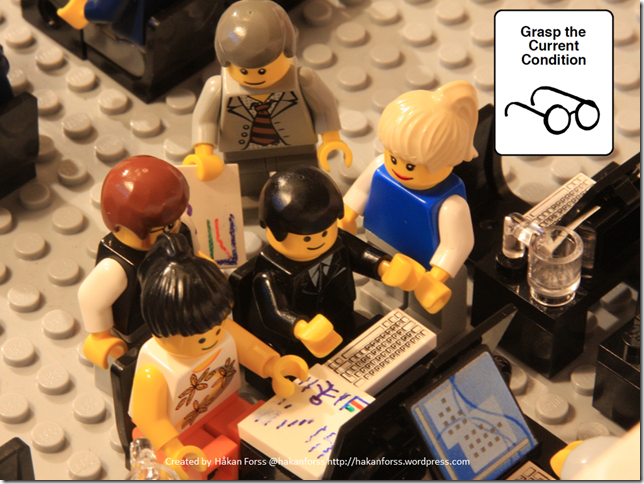 And the slideshow uses pictures of Lego figures going through an improvement session. On Hakan Forss's blog, he deals with the storytelling details in more depth. Many of the pictures with dialogue are translated into English. Hakan Forss says, "No, REALLY go and see." I love these slides. Reminiscent of the Lean Gone Lego video, the slides use little Lego people to tell a story. if you head over to Hakan's blog, you will see the whole narrative in English. His focus is on an alternative to agile retrospectives, and using the PDCA cycle, with incremental improvements, is his chosen solution. Does it work in software development? I'm sure it does! The Plan-Do-Check-Act cycle has been around for quite awhile and proven itself in many diverse environments. Here's the presentation below. As mentioned, I've added a transcript to the end of the post, but I suggest heading to Hakan's blog for the English details. 3. We have lots of good And nothing seems we need more suggestions, but all point to be really clear! focused way in different directions to improve our påHur do you think it will go? 4. What is a Kata? 7. Now everyone can focus when we know where we are on the next step we are making little to make it easier progress each day to find lösningarHur is it now? 8. Good morning Does everyone remember our goal state? 10. How to see our current situation look like? 11. We will have three user stories ready for release, we will not have the next user story this week ready for release today! 12. What prevents us to get the next user story ready today? 14. What is our next step to get the test environment to date? I will deploy as soon as we can, but we are short on disk space again! 15. I will see what I can release. 24. We will try to build new virtual test environment from a snapshot of each user storyVad is your next step? 25. I have discussed this with the team. It is not easy, but it sounds like a large lot is already in place såsteg? Each step should not we believe we can do detvara longer than a week. 27. When can we go see vadvi have learned from taking a week this step? 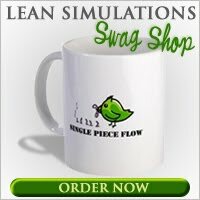 I've added this post to my list of helpful lean training tools.